The title proposes that this show can be perceived through the eyes of the owl whose vision is peripheral. Although it can only look forwards, the owl is able to turn its head nearly 360 degrees, which has led to a folklore belief that it has supernatural powers. Its ability to predict weather conditions has also inspired people to think that it can foretell the future or that when an owl is sighted it means a change is coming. In the context of this exhibition, the owl evokes associations with myth and magic but in a wider sense reflects the climate of uncertainty surrounding the current state of world affairs. ‘Vision of the Owl’ is about conflict and how our society is dealing with it, a theme that Koen Vanmechelen explores using metaphors he has drawn from his vast experience of working with the animal world. 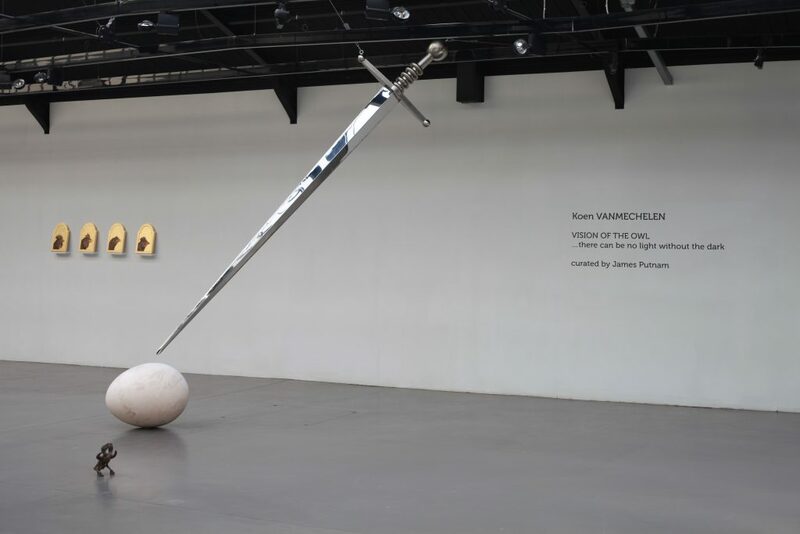 Central to the exhibition is an installation with a gleaming steel sword suspended above a marble egg that symbolizes the next generation and its menacing presence alludes to the future struggle we’ve created for our successors. But there is still hope because although a sword [GS(CC1] is a lethal weapon, when it is combined with a snake it becomes the traditional emblem for medicine and healing. 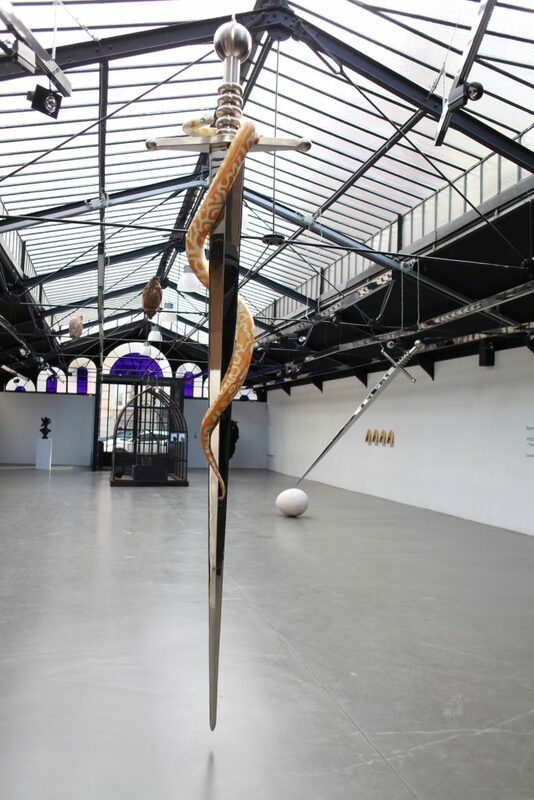 This dichotomy is re-echoed in Vanmechelen’s Medusa sculpture, the mythological female who combines beauty with terror to represent internal conflict. Her hair is a composite of venomous snakes and chicken heads, both predator and its prey. While snakes use their venom to immobilize and kill their prey, humans extract it to use as a life-saving medicine. The chickens in the Medusa’s hair also allude to medicine, since eggs are used in vaccines and other pharmaceutical products and traditional health potions. As a nocturnal creature, the owl is linked to the full moon, which in turn relates to fertility and Vanmechelen’s ongoing project that involves crossbreeding chickens from different parts of the world to enhance their fertility. His work is concerned with proclaiming the importance of the ‘lowly’ domestic chicken whose migration he maintains is directly linked to the spread of civilization. The exhibition includes a series of small portraits of chickens on gold leaf backgrounds in the style of ‘sacred’ medieval icons. But Vanmechelen’s work, it is not really about chickens but focused on the wider notion of diversity and the beneficial exchange of genetic material. His art poses fundamental questions about humanity, our identity as a species and the society we’ve created. It follows in the great Belgian tradition of René Magritte and Marcel Broodthaers who use images and objects as metaphors. Vanmechelen’s practice is also concerned with the sacred bond between animals and humans embodied in the practice of shamanism. This is illustrated by his extraordinary and monumental image of a bearded, tattooed ‘Shaman’ with an owl perched on his nest of dreadlocks. There is a sense of ambiguity in his enigmatic stare that leaves us uncertain whether he is malevolent or friendly and if he is truly a fortuneteller or like us is helpless to know the future. Another work is a hanging sculpture comprising the shaman’s coat of chicken feathers and a taxidermy owl that peers out as if enclosed within a tree hollow. 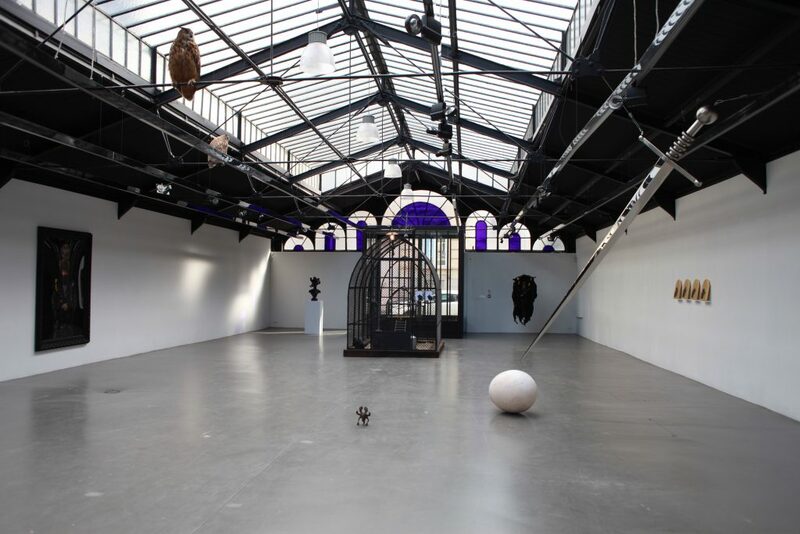 The exhibition also includes living chickens from Vanmechelen’s cross-breeding project, kept in a large iron cage while a pair of taxidermy owls perched high up in the gallery stare at them with their wise ‘all knowing’ eyes. In the mind of the chicken this gaze is full of danger because the owl is a predator and they are its prey. Ironically they are dead so pose no threat to the chickens but their presence is nevertheless foreboding. This serves to remind us that whatever wisdom we may have accrued through the course of history we continue to live under the threat of impending danger and conflict. 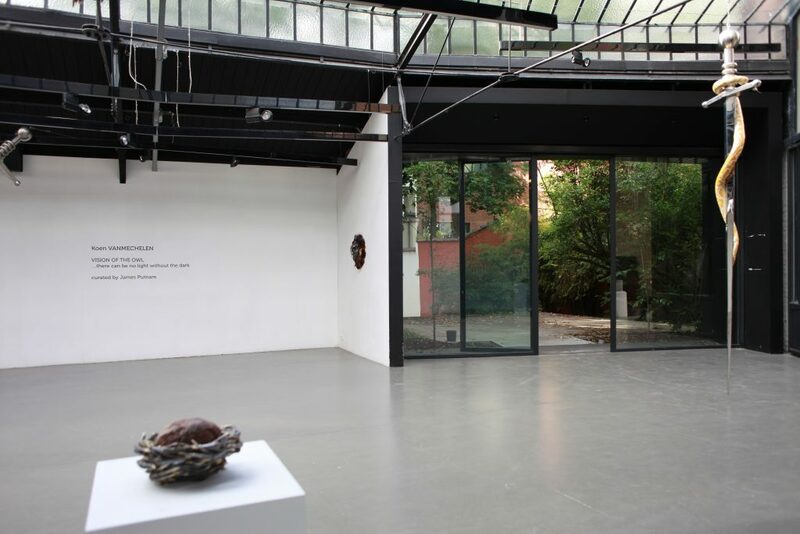 Koen Vanmechelen ‘Vision of the owl’ Installation view at Galerie Valérie Bach, Brussels, 2017.